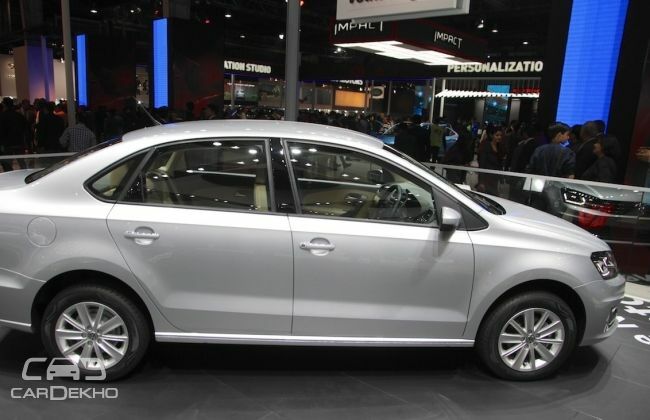 Volkswagen has introduced a new variant in the Vento’s lineup, the Highline Plus. The Highline Plus variant is the new top-spec variant and will be placed above the existing Highline variant. The 2017 Vento Highline Plus has a starting price of Rs 11.39 lakh (ex-showroom, Mumbai) and was also showcased at the 2016 Auto Expo. Let’s have a look at what the new variant has to offer. Apart from the existing features offered in the Vento Highline variant, the 2017 Vento Highline Plus has a few more additional features. It has full-LED headlamps along with daytime running LED lamps and also offers a reverse parking camera as standard equipment. It rides on a new set of 16-inch alloy wheels and is Rs 80,000 more expensive than the current top-spec Vento Highline. The new sedan is being offered with the same engine options as other variants. You can choose between three engine options — a 1.6-litre MPI naturally aspirated four-cylinder petrol, 1.2-litre TSI turbocharged four-cylinder petrol, and 1.5-litre turbocharged four-cylinder diesel. The 1.5-litre diesel engine is being offered with both manual and automatic transmissions. However, while the 1.2 petrol engine is only being offered with a DSG automatic gearbox, the 1.6 petrol engine has been coupled to a manual gearbox. The new cars have already been spotted at dealerships and can be booked for a token amount of Rs 75,000. The Volkswagen Vento faces tough competition from the Honda City and the Maruti Suzuki Ciaz. The facelifted Honda City is likely to launch in February and Maruti is also expected to launch the Ciaz facelift within the first half of 2017. This would further add more competition in the C2 sedan segment.